At long last, an open mic just for the young musicians! Every act needs at least one member who is in their teen years. All axes, genres, and skill levels are welcome. Students from any school anywhere are welcome. 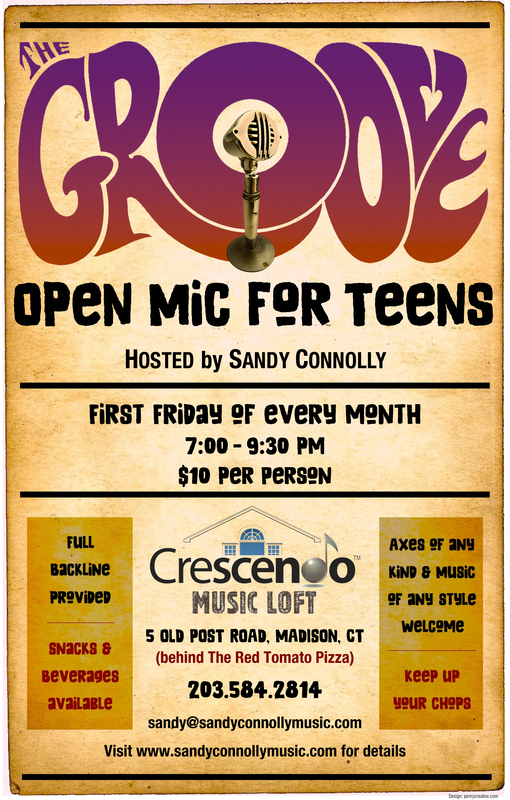 This takes place in Crescendo’s very own Loft on the second floor of 5 Old Post Road in Madison, Connecticut. Google Maps will take you right there, but you’ll think you’re in the wrong place as Crescendo Music Loft is in a boatyard on a dead end. It’s the perfect place for teenagers to be in a non-bar environment and to make a lot of noise that’s not going to bother anyone. Stage lights, full PA, and backline are provided. The backline includes: drum kit, bass amp, Fender Deluxe Hot Rod guitar amp, and a beautiful Yamaha S-90 SE keyboard. Parents, other adults, and more experienced musicians are all encouraged to participate as audience members and performers and pay attention as the younger ones hone their chops. The Shoreline is rich with teenage musicians who mean business, and we hope they will share their music with us at this event. At least one member of your act must be a teenager. You must write your name on the list with your own hand before 8:00 p.m. to get in the line-up. At least one member of your act must be present to sign up. If you don’t write your name on the list, even if you are my very best friend, I will probably forget about getting you to the mic. Speed between acts is very important. Have your instrument tuned and know what songs you’re going to perform before you walk on stage. Latecomers might get in, but I’m not promising.